WE ARE ABLE TO ACCEPT CALENDAR MONTH RENTALS ONLY (other than for a last minute booking). WE ARE GRATEFUL TO YOU BEFORE ASKING FOR RATES, AVAILABILITY, AND SPECIFIC QUESTIONS, IF YOU WOULD PLEASE READ THROUGH ALL THE INFORMATION IN THIS WEB SITE. OUR PROPERTY AVAILABILITY CALENDAR IS KEPT UP TO DATE. Thanks and mahalo. Sorry, no smoking or pets. Includes WI FI internet access, parking, full size insuite washer/dryer, and free long distance calling to anywhere in the United States and Canada. HIGH FLOOR VIEW SUITE. Large 900 SF (84 square meters) - NOT THE SMALLER 540 SF SUITE, designer furnished Colony Surf studio apartment; Step into a classic restored Hawaiian suite. Features living room, dining room, sleeping alcove, one bath, full sized kitchen, one parking, complete with all services, and in a spectacular Gold Coast location! On the Island of Oahu, on the waterfront, near the base of Diamond Head Volcano, across the street from huge Queen Kapiolani Park, in the exclusive 20 story Colony Surf condominium building. LOCATION: The 'Gold Coast' is world renowned because of its many exclusive waterfront residential buildings. This location appeals to permanent residents of Hawaii, who appreciate a quieter neighborhood atmosphere; a benefit for longer stay visitors, or executives on assignment. It is a leisurely 15 minute waterfront walk to busy Waikiki amenities. SUITE: This spacious 10th floor apartment (approximately 900 square feet or 84 square meters) has spectacular, unobstructed ocean and Diamond Head views from an expansive 25 foot wide window opening (windows slide back to both sides). It is laid out as a very large Hawaiian style studio, with quite separate areas for the living room, dining room, and sleeping alcove. The kitchen is in a separate room. FURNISHINGS: Our second home has newer classic designer furnishings and appointments, INCLUDING FULL SIZE IN-SUITE WASHER/DRYER and all linens and towels. Ceramic floor tiles and newer carpeting throughout. Suite is on the cooler side of the building, with living room and bedroom facing south-east, and kitchen and bathroom facing north-west. Windows on both the front and back of the apartment, allow the trade winds to blow through, making for a comfortable atmosphere during the warmest summer days. KITCHEN: includes marble and stainless steel counter-tops, gas cook-top, self-cleaning gas wall oven, dishwasher, microwave, all small kitchen appliances, dishes, cutlery, etc. BEDROOM AREA: Rattan furnishings are used extensively in the sleeping area, which includes a California king-size bed, along with a comfortable chaise for reading. The spacious bathroom features a marble counter-top, 12 feet of mirrored closets, and a shower stall with excellent water pressure. OFFICE AREA: A large antique desk separates the dining and living rooms, and serves as an office area with computer workstation, complete with telephone, secured high speed wireless internet and answering machine. The desk-top access-panel allows you to connect your computer or laptop to an under-the-desk power outlet. Free long distance calling to anywhere in the United States or Canada. LIVING ROOM AREA: Has two open ended sofas, a large glass coffee table, and two contemporary style upholstered occasional chairs. Included are a 40" LED Flat screen TV with cable service, standard DVD player, and stereo with CD player. DINING ROOM AREA: Has large glass and wrought iron table with 6 chairs. Huge, beautiful antique Japanese wall mural on wall adjacent to dining room table. BUILDING: Has an elegant lobby, an exclusive French restaurant ('Michels'), a private sandy beach (no rocks), 24 hour security, and locked-off elevators. Nearby are two smaller upscale hotels for your guests (The New Otani and The Aqua Lotus). Sorry, no smoking or pets. You might want to check to see if suite is suitable for children under 10 years of age, due to the rather open nature of the railing (across living room and bedroom), which begins at the 30 inch height. Cleaning service available upon request at $30 per hour (minimum 2 hrs). CALENDAR MONTH RENTALS ONLY (other than for a last minute booking). ONE MONTH CONTRACT: To reserve, requires 50% payment of the rent, plus once only $250- final cleaning charge, plus 14.96% Hawaii State taxes, plus VRBO service fee. No later than 90 days prior to contract start we will have received your final 50% rent and Hawaii taxes, plus the standard $1,000 refundable security deposit. All payments to be made by way of Credit or Debit Card., Thanks and Mahalo. If you cancel, there will be a refund, once we contract with a replacement client ($250 admin. fee). We purchased in this upscale beachfront building, as we were tired of leasing vacation rentals, which were often dirty, and had threadbare furnishings. This is a second home for us, and ownership allows us to maintain our suite to higher standards. This Gold Coast location (at the base of Diamond Head Volcano), is just a 15 minute waterfront walk to busy Waikiki, and across the street from huge and beautiful Queen Kapiolani Park. The quieter neighbourhood appeals to permanent Hawaii residents; a bonus for you. There is a semi-private sandy swimming beach at the front of our building, which is shared by our building, and the Outrigger Canoe Club next door. Building has 24 hour security, with staff during the day, and security personnel at night. Two upscale hotels with restaurants, and a small convenience store are within 1/2 block. Renowned Michel's French restaurant is accessed off the lobby of our building. Large bathroom with great shower water pressure. Large marble counter top, along with 12' of mirrored closet doors. Free local calls and free long distance calling to USA and Canada only. WIFI modem has wireless signal. Very well supplied as an owner's second home; Includes dishes, glasses, cutlery, pots and pans, cooking utensils etc. etc. Kitchen has sink, gas stove cook-top, self-cleaning gas oven, dishwasher, microwave oven, as as well as coffee-maker, tea pot, 8 place settings, cutlery, utensils, pots, pans, corning cook-ware, etc. Glass and wrought iron dining room table with 6 chairs. Private Sandy Beach, 24 Hour Security, Locked-Off Elevators, Answering Machine, DVD player & Stereo with CD Player, In-suite washer/dryer, Covered Assigned Parking, No Smoking Please, Not suitable for children under 10 years old, due to quite open railings, above the 2 ft. height, across both the living room and bedroom areas. The suite is very comfortable and nicely furnished. Located just outside of Waikiki in Diamond Head - away from the main tourist area but a 15 minute walk there for restaurants and Waikiki beach. John and Terry are excellent hosts. Our daughter who eats a vegan diet stayed with us over the Christmas holidays - John sent us a list of vegan food places recommended by a local friend who is vegan. Thanks Peter. With it being our 2nd home, we've tried to create a home away from home, rather than just your basic vacation rental. We spent December 2016 at the beautiful 10th floor condo at the Colony Surf. We thoroughly enjoyed our stay in the spacious studio in this terrific location. The thoughtful and attentive owners have provided everything that visitors would want. The spectacular view of Diamond Head and the Ocean from the large sliding windows afford a very memorable experience. We enjoyed some special meals at the nearby historic HAU TREE Lanai Restaurant . A great location for walking with good public transportation just steps away . A very nice quiet and well managed building and a very nice beach. Thank you John and Terry for making our stay so wonderful. This is a well appointed level 10 large studio with stunning views to the surf breaks at Rice Bowl & Tongs and back to imposing Diamond Head. Far enough away from Waikiki so you don't feel like a tourist but close enough for the activities with your own "private beach" a special treat. We will be back for another summer holiday in winter! We stayed in this beautiful 10th story condo in April 2015 and it will not be our last visit! Perfect location, great private beach, fabulous views of Diamond Head and the Ocean, immaculate and well-appointed by very conscientious owners. And of course, Michel's downstairs. After 27 years, the Colony Surf is still the place!. Mahalo to Terry and John. We enjoyed our annual 3 month winter escape in this unit as it is comfortable, clean, and had all the amenities required in the kitchenette, bathroom, and in-suite laundry facilities. The location of this accommodation is supurb as it offers the ocean, the park, tennis courts, and good bus service all right outside your door while being within a 20 minute walk to all the major activities and attractions of Waikiki. We particularly enjoyed not having to require air conditioning as the trade winds flowed throughout the unit very nicely. Great, attentive, and responsive landlords as well should anything be required as they were very accessible. We would have no hesitation recommending this unit for a nice Hawaiian holiday. My wife and I stayed for the month of July while we were looking to purchase a home on Oahu. We have spent considerable time on Oahu previously including one stay at the Colony Surf a number of years ago. The CS is a really terrific place with its location, parking, beach and very helpful staff. The building is in good condition and well maintained. We found other residents and guests to be very friendly adding to the relaxed atmosphere. The condo is in very good condition and well equipped for month-long stays - we felt right at home. 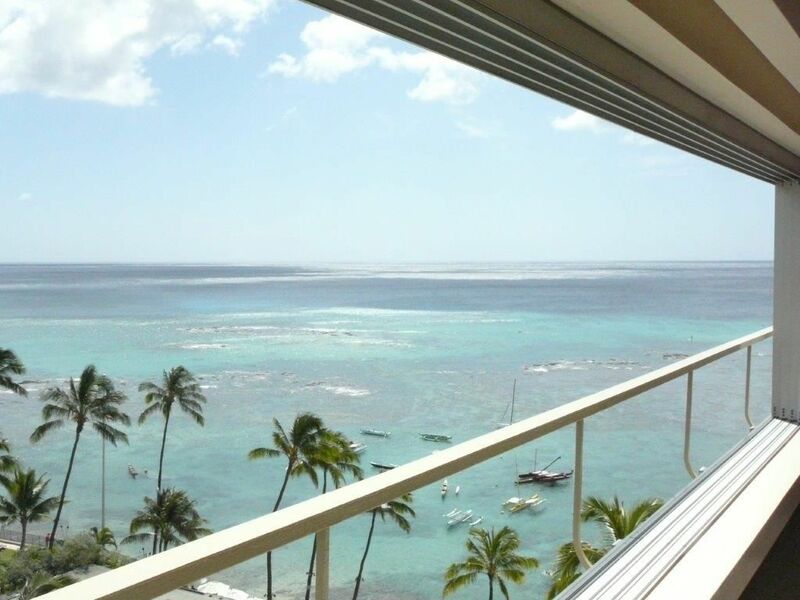 Trade winds keep the condo very comfortable and combined with the ocean/Diamond Head views, it is hard to beat. By the way, this unit faces east versus other units that are on the south side of the building directly overlooking the ocean. We think east facing is much preferred as there are ample ocean and DH views and the ocean facing units get full-on sun all afternoon. The beach at the CS is incredibly convenient, popular in the afternoons but not overcrowded, and there is a shower for rinse off afterward. We discovered that morning swims were also a real treat. Logistics are very convenient. There is a Safeway five minutes away on Kapahulu (another minute further is freeway access), Whole Foods at Kahala Mall, and Costco at Hawaii Kai. Walk into Waikiki, Kapiolani Park across the street, Diamond Head for an easy run in the morning. One recommendation to the owners. During our stay we redirected our Netflix DVDs for delivery to the CS (showed up in the mailbox on a very timely basis) but found that the DVD player in the unit did not play Blu-Ray discs. We actually went to BestBuy and purchased a new player ($99), connected to the TV (which is an HDTV) and enjoyed watching House of Cards, etc. Might be time to upgrade the DVD player in the condo. As we are moving to Oahu we will not likely have the occasion to stay here again but have recommended this condo to several friends.
. WE LEASE ONLY BY THE CALENDAR MONTH, which is from the first day of any calendar month until 10 am on the last day of any calendar month. . It is recommended that you obtain cancellation insurance for any prepaid $ amounts..